Platinum Rustic Wrangler Bracelet. This western design measures 8mm x 8mm and we estimate the suggested 8 1/2 length to weigh 64grams. Secured with a very nice lobster clasp. Custom hand made to order, if you need alternate length simply email for pricing. 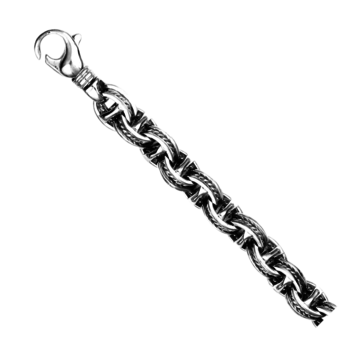 **Our custom Platinum chain pricing is based on weight. We estimate as close as we can but because our custom chains are hand made and hand polished weights will vary. We charge 50% to start a custom project and the *adjusted balance when we ship. Adjusted balance is based on the actual weight, can be less or more then the estimate. (usually within 10%) This way you are paying for the actual weight you receive. Please contact us with any questions.